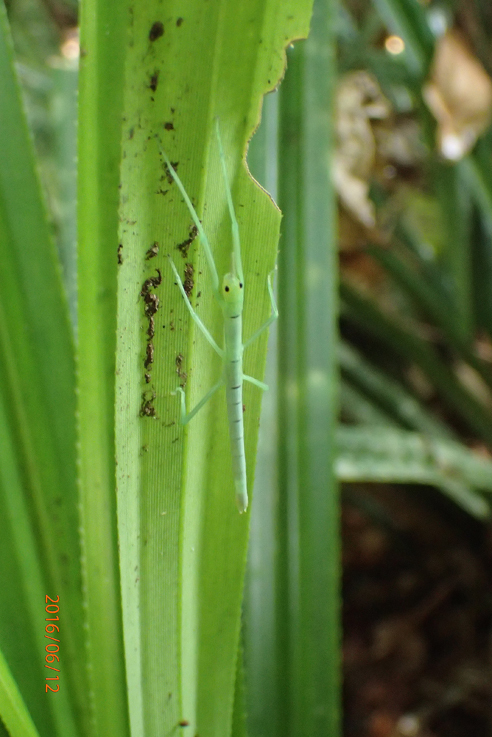 Undoubtedly the insect icon of the Daintree Rainforest on Cape York Peninsula, north of Cairns, Queensland is the large, flightless Peppermint Stick-Insect, Megacrania batesii (Kirby). I have written about this beautiful insect before and you can find details about its occurrence and history at this reference. It is such a nice insect that it deserves an additional blog. At Cape Tribulation it can be found within centimetres of hikers that move up and down the trail. No mention of it is to be found on the descriptive sign but tour operators know it is there and often point it out to their customers. It is a large insect with females measuring over 110 mm in length. They are beautifully coloured with blue, green and yellowish green predominating. 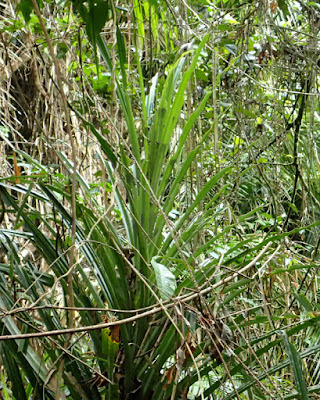 The sticks reside within the midrib of their host-plant, Pandanus tectarius. They often "sun" during the day in a characteristic posture. They have excellent eyesight. 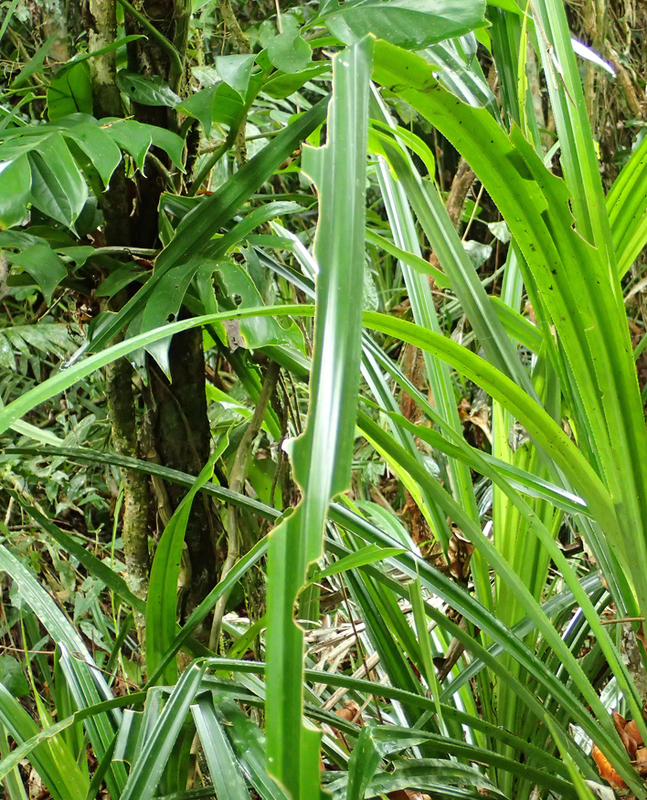 When danger threatens, they scuttle back and forth in the midrib, often backing down to the base of the plant where the serrations along the margins of the plant offer considerable protection. The common name of the stick is based on the behaviour of the insect when it is greatly disturbed. Prothoracic glands (arrow) exude a volatile liquid that smells to us like pleasant peppermint. This is so volatile that it can be detected several metres from the source. It is amusing to watch the reaction of hikers when they first detect the odour as the move by. Most think the smell is a plant of some sort but are surprised when they are advised of the source. The small nymphal stages of the Peppermint Stick are also strikingly coloured. 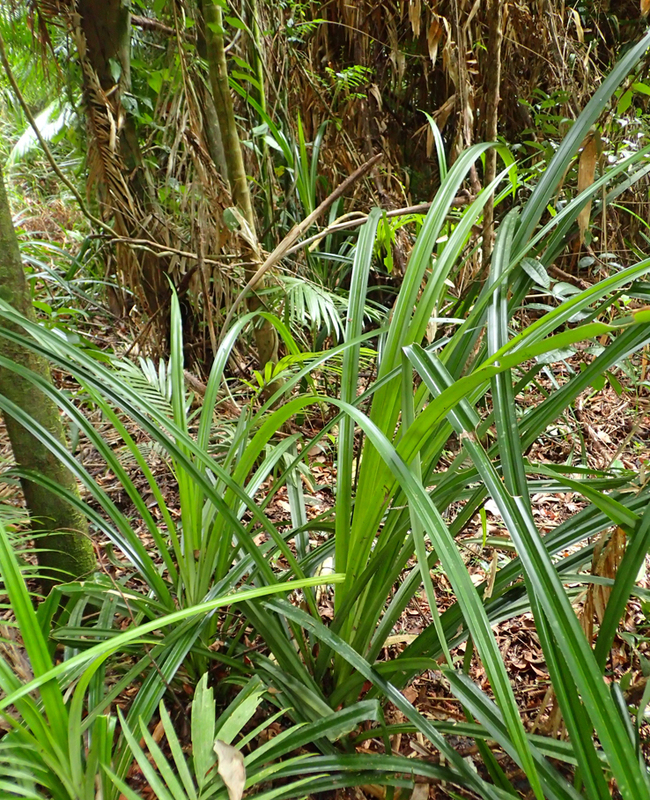 Most of the Pandanus plants are not occupied by the sticks and display no damage. With a little practice, one can sight plants that are likely to harbour the sticks. 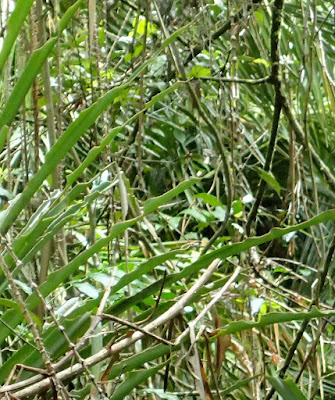 Note the condition of the leaves in the background. This is from feeding but it can be many weeks old. These leaves have been eaten by several sticks over time. This feeding damage is severe and obvious. At a picnic area to the south, the sticks almost totally defoliated the host plants. 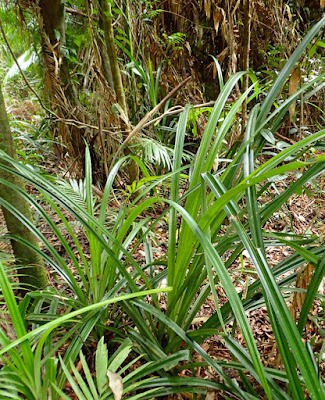 Some patches of Pandanus are more affected than others. Why is this so? No one has the answer. It could be that some plants taste different and therefore, there are plants the insects prefer. Or it can just be serendipity-they have patchy distributions because they have patchy distributions. There is the opportunity for some research here. The Peppermint Stick-Insect has an odd geographical distribution. It is known from the Solomons, New Guinea and the Bismarck Archipelago. 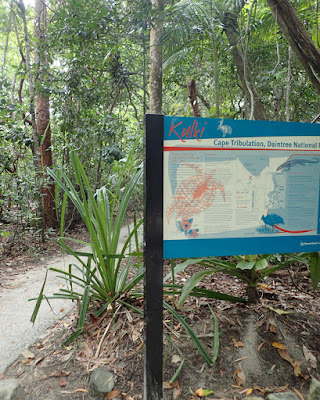 In Australia it has been found from Cape Tribulation south to Clump Point, south of Innisfail. The egg-laying habits of the females may have the answer to its spotty distribution. 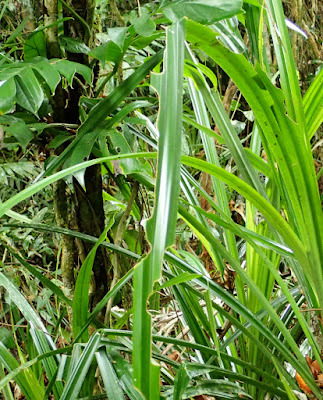 Eggs accumulate in the detritus at the base of the leaves in the axils. 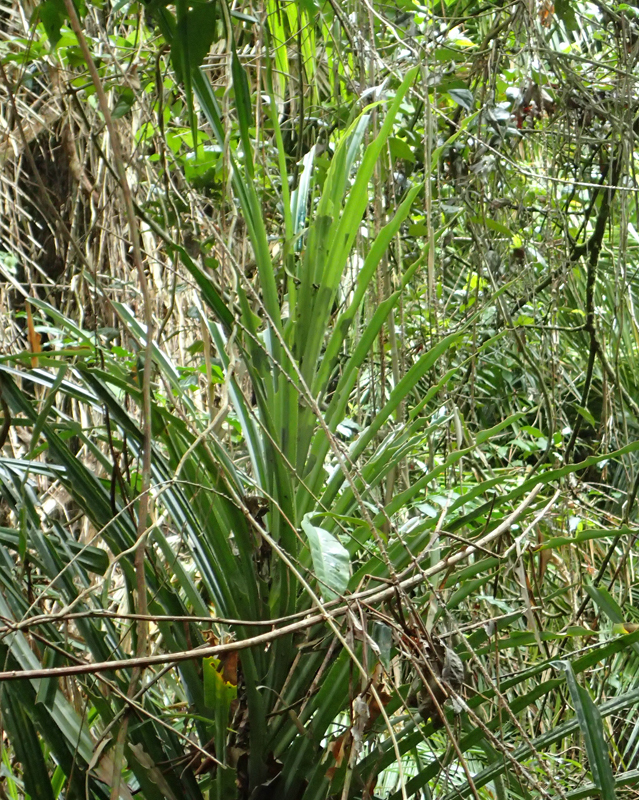 During cyclones, clumps of Pandanus often become dislodged and float out to sea. Some may reach shore at a locality far removed from the source. Perhaps, this is how the Peppermint Stick-Insect gets around. But it does not explain why some plants are occupied and others are not.